First off, I want to thank Tony and Daniel for giving me this opportunity to do a guest review and share a little piece of my passion with fellow B/SOTLs. 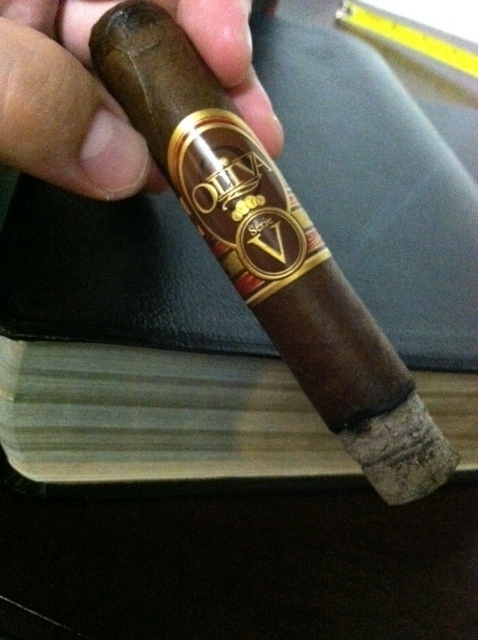 With the Oliva Serie V Melanio (Find Tony’s review of the Melanio here) beginning to hit the shelves of local B&Ms, I decided to touch base with the original Oliva Serie V. Today, I will be firing up the Oliva Serie V – Ligero Especial Double Robusto Tubo. This cigar was purchased by my better half at Fox Cigar Bar in Gilbert, AZ and gifted to me for Father’s Day. The band is the traditional Oliva Serie style band found on the Serie G, O, and V. Simple but elegant. It is the type of band that says “I will let the cigar speak for itself”. The wrapper has the appearance of well aged leather with a slight reddish hue. Light dances off the beautiful oils on the wrapper. The triple cap has been neatly applied and there are small veins running the length of the cigar with a slight tooth. The wrapper gives off minimal aroma of spice and clove, while the foot highlights rich tobacco with spice lingering in the background. The cap clips easily with my Xikar Xi cutter exposing an effortless draw. After torching the foot of the Serie V, I am presented with an ocean of dense, flavorful smoke that fills my mouth with each puff. A hefty amount of spice warms my mouth and awakens my palette. Flavors of pepper, cedar, and pencil shavings excite my taste buds. As I retrohale, pepper coats my nasal passage followed by notes of cedar. I find a slight bitterness peeking out behind the more dominant flavors leaving a char finish. The even burn is producing a gray ash. Flavors are at full force, with the strength in the medium-full range. I have only a slight nicotine kick at the close of the first third. Entering the middle third, I have yet to ash the cigar. Cedar notes are coming to the forefront, spice begins to lessen, and a black tea flavor shows through. The retrohale continues to deliver the pepper found in the first third leaving me with a sensation to sneeze. I love when a cigar does that. And Yes, I am a huge fan of pepper. The char finish picked up earlier has transitioned into a burnt roast coffee taste, similar to a Starbucks’ roast. 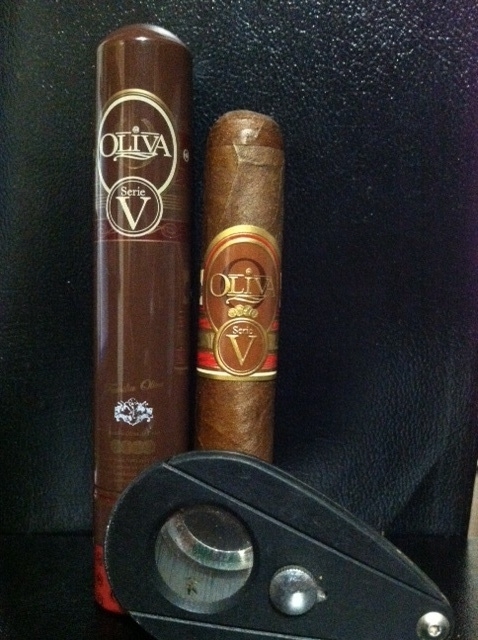 The strength has picked up steadily through the Oliva Serie V. Can you say nicotine buzz? The ash continues to hold on strong as it approaches the band. Deciding to avoid any accidents, I tap off the ash into the ashtray. The band peels off easily with absolutely no worry of damaging the wrapper. Time is flying by as I settle in on the final third of the Oliva Serie V. The cigar has balanced out noting flavors of black coffee, pepper, cocoa, and cedar. Nearing the end of the cigar, clove enters the flavor profile. 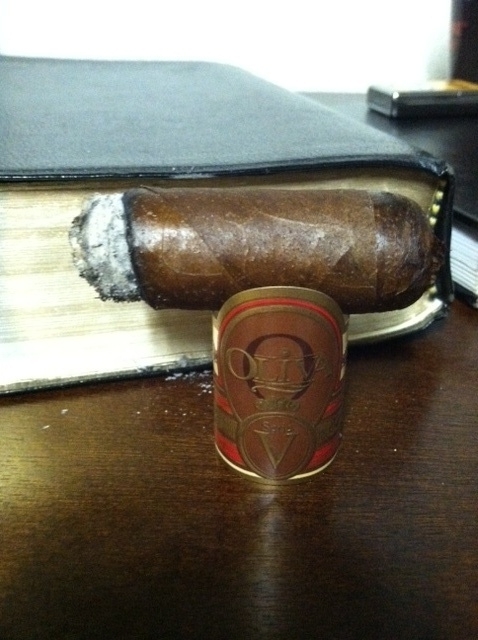 The start of the Serie V warmed my palette, now the nicotine kick is warming my body. It is the familiar warming sensation you get after sipping a whiskey. The flavors are well balanced and the ash drops on my lap at ¾ in. I am a sucker for lanceros and try to keep a few Oliva Serie V lanceros in the humidor at all times. You just can’t beat the awesome price point of the lancero. But I do believe the Serie V Double Robusto V delivers more full flavors and strength which could be attributed to a larger ratio of the ligero filler in the larger gauge. There is no babysitting this cigar. 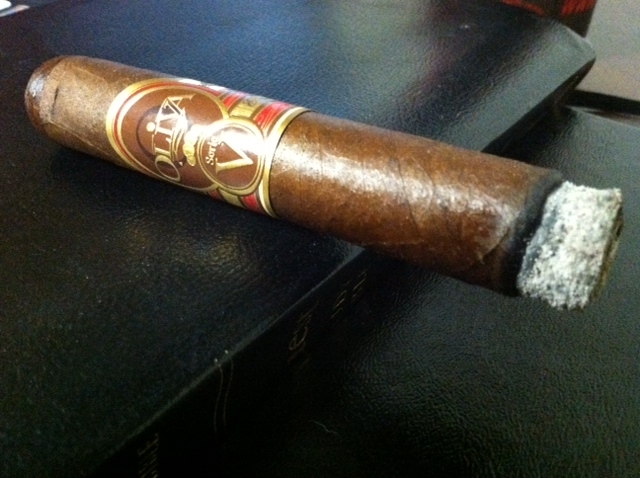 The Serie V burned razor sharp, and it is ready to produce tons of smoke even after sitting for a few minutes. This cigar did not disappoint. I encourage everyone who enjoys medium/full cigars to pick up the Oliva Serie V – Ligero Especial, fire it up, kick back, and enjoy the journey. Nice review. This is the only cigar that has ever made me dizzy from nicotine. I started to get that dizzy feeling too! Just happy I didn’t puke. lol. I couldn’t recall any other Serie V being so strong. The time I smoked it and whatever I ate or did not eat beforehand could have contributed to the nicotine kick as well. Terrific job picking up for the slackers, Jeremy! LOL I’m also a big fan of the lancero and No. 4 corona, and I think what you pointed out regarding ligero ratio is why I prefer them. I’ve only had one torpedo, though, so I’ll have to give this one a shot. Great review and great pics J! I probably would have to smoke this after a Steak and Potatoes kind of meal or else you’d probably find me on the floor. Look forward to enjoying more great sticks with you and Tony. Great review! From the way he lovingly described what must be an excellent cigar I almost felt guilty reading it. Nicely done Jeremy and thanks for sending in the guest review for us! One tip for strong cigars like this, pair it with something that has a bit of sugar in it. I personally reach for Port with my stronger cigars. The sugar really counteracts the nicotine effect. A bit meal helps too! Jeremy Great review buddy, I’m a big fan of the V line I think they are a great cigar. I agree they are strong some hit me more then others but like Dan said a nice sugary drink and a meal will help calm the shakes. Keep up the great work and look forward to more reviews in the future.